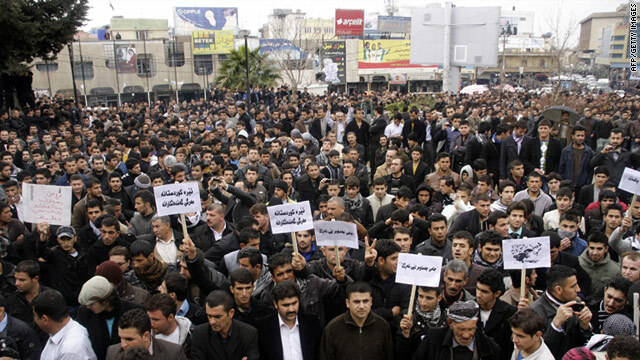 Iraqi Kurdish anti-government protesters march in the city of Sulaimaniya on Thursday. Authorities impose a curfew until 6 a.m.
Baghdad (CNN) -- One person was killed and 57 were injured Thursday when hundreds of protesters clashed with security forces in Sulaimaniya, a city in the Kurdish region of northern Iraq, according to Dr. Raykot Hamed Salih, a health official there. Dozens of protesters attacked the Kurdistan Democratic Party headquarters in the city and destroyed furniture and computers inside the building, police officials in Sulaimaniya told CNN. Witnesses told CNN that a number of Kurdish security forces, known as peshmerga, opened fire to disperse the protesters. The demonstrators were angry about corruption, the quality of basic services and unemployment, Salih said. Authorities imposed a full curfew, banning cars and pedestrians from moving around the city until 6 a.m., police said. The Kurdistan Democratic Party is headed by the Kurdistan region's president, Massoud Barzani, an important power broker in the region. Iraq, like many of its neighbors, has been convulsed by popular protests since demonstrations toppled the leader of Tunisia last month. A least one person was shot dead and 55 others -- including four police -- were wounded Wednesday when private security guards and Iraqi security forces fired on hundreds of demonstrators outside the governor's office in the eastern city of Kut, health officials said. Police officials in Kut, about 65 miles (110 kilometers) south of Baghdad, tell CNN that nearly 2,000 demonstrators demanded the resignation of Wasit's provincial governor, Latif Hamed, accusing him of corruption. Some of the protesters tried to force their way inside the governor's office, prompting private security guards to shoot at them, police said. With the shooting, the situation escalated rapidly and the protesters became angrier, Kut police said. Dozens of protesters stormed the governor's office again and destroyed furniture inside, then set the building on fire. Another group of demonstrators went to the governor's house and set it ablaze. Kut police tell CNN that Hamed was not in the city when protesters attacked his office and home. The protesters were heard shouting, "Down with (Prime Minister Nuri) al-Maliki, down with the corruption, down with thieves." Others were carrying a banner that said, "Eight years of suffering, where are your promises?" referring to the Iraqi government that took power after Saddam Hussein's regime fell in 2003. In Falluja, hundreds of protesters walked toward the city council building and the mayor's office on Tuesday, demanding the resignation of the mayor and the head of the city council because of corruption and their inability to provide basic services to the people. For the first time since the demonstrations started across the country more than two weeks ago, Iraqiya state TV broadcast video of the Kut demonstration and urged people to protest peacefully and not to turn to violence.